Royal Queen Seeds is amongst the fastest growing cannabis seed companies in Europe. 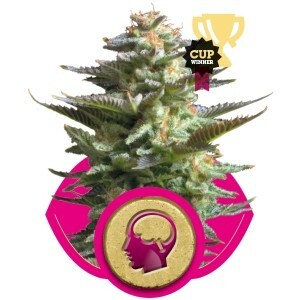 After building up many years of experience in growing cannabis seeds in the Netherlands, they decided to launch their own line of cannabis seeds and are now able to offer you quality feminized, autoflowering and medical seeds at a good price. Cannabis, Marijuana, Weed, Skunk, Bud, Chronic, Ganja – whatever you call it, they have a great selection of feminised, autoflowering and medical seeds for you to choose from. These days there are many different strains of cannabis seed and such a wide range of seed companies to choose from, choosing your cannabis seeds can be daunting. At Royal Queen Seeds they pride themselves in offering a good selection of high quality cannabis seeds at fair prices. Whether you are looking for an Indica, a Sativa or an autoflowering strain (containing Ruderalis genetics), they have something for every weed lover’s taste. All of their seeds are feminised, meaning you’ll have no male plants to identify and remove – so you can concentrate on raising the bud producing female plants. All of Royal Queen Seeds are grown organically, selected by hand and regularly tested to check the quality and germination rates. They also pack them in strong packets to protect them from the environment, ensuring that when you get your hands on them, they are in the best condition they can be. They only keep powerful qualities like Haze or white species. Seeds are tested daily to guarantee their “germinating strength”. Cannabis seeds are vacuum packed. They are happy to ship their seeds to many countries around the world. Before ordering, They gently recommend confirming your item selection(s) and your country are included in their shipping list. Making sure their customers receive their packages safely and efficiently is important for them. By utilizing a tracking service for many of their products customers can easily track their orders.